The Proton replacement -- the Angara rocket -- had been in development since the beginning of the 1990s and with considerable investments already committed to the project it was expected to fly its first mission in 2011. However the vehicle was primarily intended for delivering military and commercial satellites from its newly built launch pad in Plesetsk. Giving the role of manned launcher to Angara would essentially leave the entire Russian rocket fleet in the hands of a single contractor -- Khrunichev enterprise, a clearly to be avoided "all eggs in one basket" strategy. In the meantime, the existing "alternative" developer of the Soyuz rocket -- TsSKB Progress in Samara -- could be out of the job. The Zenit rocket could carry the minimal mass considered for the next-generation spacecraft and it also provided a newer design than that of Soyuz and Proton. It could potentially be upgraded for higher payloads. However, after the collapse of the Soviet Union, the production of the vehicle ended up outside Russia, in Ukraine, making it politically unacceptable for the nation's goal of maintaining independent access to space. Organizing production of the Zenit in Russia could be considered, however it would require sizable investments, perhaps approaching the potential cost of developing a whole new rocket. By 2008, the development of a whole new family of rockets for manned space flight had become attractive to the Russian government, especially in light of the decision in the previous year to build the new Vostochny launch site. The strategic decision to place the space center in the Russian Far East brought up the issue of transporting the vehicles from industrial centers in western Russia. The size of rocket stages would either have to be limited by the capabilities of railway transport, or the Russian government would have to commit to the development of a compatible air transportation system. Finally, the third alternative would be the development of a whole new manufacturing base right there in the Far East. Despite being probably the most expensive and economically difficult proposition, it would match the political goal of the Russian government to industrialize this isolated and sparsely populated region. Ultimately, the Russian space agency made the pragmatic decision to keep the development of the rocket at the existing manufacturing base in the European part of Russia and to use traditional rail transport to deliver fully assembled stages of the vehicle to Vostochny. Exotic ideas, like using dirigibles to transport oversized stages, were quickly rejected. As a result, the diameter of rocket stages was limited to 3.8 meters and length to around 25 meters, to ensure their unimpeded transport by rail via the narrow tunnels and sharp turns of the Far-Eastern railway lines. Upon committing to the development of a new vehicle, the Russian space agency had to decide about the design of the future rocket and choose its manufacturer. During 2008, all major rocket "firms" competed for the role of building a future manned launcher. In the third quarter of 2008, the "system evaluation" of the rocket's possible architecture was completed and several proposals were apparently submitted to Roskosmos by Sept. 1, 2008. 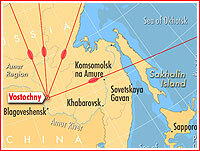 Although Roskosmos made no formal announcement on the matter at the time, unofficial postings on the forum of the Novosti Kosmonavtiki magazine indicated that the agency favored a two-stage launch vehicle, which would be developed by the conglomerate of TsSKB Progress in Samara, KB Mashinostroenia in Miass and RKK Energia in Podlipki (Korolev). TsSKB Progress would bear overall responsibility for the launch vehicle and its second stage. KB Mashinostroenia would develop the first stage. Finally, RKK Energia was expected to oversee the manned transport system. Thus, all key players in the industry would retain their traditional responsibilities and preserve their overall workforce. In an interview with the BBC in March 2009, Aleksandr Chulkov, the head of the launch vehicle and infrastructure directorate at Roskosmos, said that the key factor determining the winner in the government tender would be the price tag. He confirmed previous reports that the launch vehicle would have to be able to carry at least 20 tons and a maximum 23 tons to low-Earth orbit. Within the Russian nomenclature, the new rocket would be classified as a "medium-lifting-class vehicle with increased payload capacity," or "RN SK PG," while vehicles classified as heavy lifters would carry from 35 to 50 tons into low-Earth orbit. Chulkov said that requirements for heavy-lifting capabilities within the manned space program would be met by the Angara family of rockets. Still, it was reported around the time that the new rocket, equipped with five standard boosters on the first stage instead of three, would be able to deliver 35 tons to the low Earth orbit, while another variation, including four standard boosters on the first stage and one on the second stage, could carry 50 tons. Thus, as a family, the new rockets would overlap the capabilities of Angara rockets. Even more ironically, Roskosmos apparently favored the architecture of the rocket, which closely resembled RKK Energia's failed bid to develop the Angara family of vehicles in the 1990s. Known as Angara-2, the proposal featured three standard boosters on the first stage, equipped with an RD-180 engine each. At the time, the Angara-2 concept was rejected in favor of the architecture proposed by Khrunichev enterprise. Since Roskosmos reportedly called for the construction of as many as 15 launchers per year, the program could require the production of as many as 45 RD-180 engines annually. (Official documentation later called for 15-20 launches per year!) Even with a "low" rate of four launches a year, 12 RD-180 engines would be required annually. Due to such high numbers being compounded by the need to produce the same powerplants for the American Atlas rocket, it looked possible that an additional manufacturer based in the city of Perm would be brought into the project. The same company was responsible for mass production of the RD-191 engine for the Angara rocket. By February 2009, Russian space agency, quietly published a set of official requirements for the future rocket, dubbed Rus-M. Although on paper, prospective developers had to compete in a federal tender to meet these specifications, it was a mere formality. The published description of the rocket, including its name, was skewed heavily toward proposals made by the TsSKB Progress/RKK Energia team. As expected, the first stage of the medium-lifting rocket had to consist of three standard boosters, each equipped with a singe two-chamber RD-180 engine. In 2010, a special version of this engine, designated RD-180V, was identified for use in Rus-M rocket. It apparently differed from the base model by the addition of an extensive network of diagnostics sensors which could help trigger the crew escape rocket at the first sign of catastrophic problems with the engine. The entire cluster of three boosters would remain inseparable during the flight. The unmanned version of the rocket would have to deliver 23.8 tons to a 200-kilometer orbit with an inclination of 51.7 degrees after launch from Vostochny. The rocket modules of the first stage had to be adaptable to serve as the first stage of a heavy-lifting rocket with a payload of no less than 50 tons and a super-heavy lifter with a payload above 100 tons. Perhaps the most controversial set of requirements formulated by Roskosmos included Rus-M's emergency capabilities, which seemed extremely conservative. From the moment of liftoff, the rocket had to have the capability to clear the launch facility in the event of a complete failure of a single engine. There were also reports that, during manned launches, the rocket had to make it far and high enough on two remaining engines to enable the crew vehicle to make a splashdown in the Pacific Ocean. Thus, the manned spacecraft would avoid landing in the difficult terrain of the Far Eastern taiga, downrange from Vostochny. According to unofficial reports in 2008, Roskosmos considered using either kerosene or hydrogen on the second stage of the vehicle. However at the beginning of 2009, the head of Roskosmos, Anatoly Perminov, told the Russian press that hydrogen would be used on the second stage. The official technical assignment called for a monoblock second stage powered by four RD-0146 engines. The emergency abort mode would allow a 20.7-ton payload to make a single orbit around the Earth after the failure of one of four main engines on the second stage. Roskosmos also required the developer to provision a controlled deorbiting of the second stage. Back in July 2008, KBKhA design bureau in Voronezh first announced that it had proposed a concept of new-generation engines for the prospective launch vehicles, which would fly from Vostochny. According to KBKhA, the new series would burn a mix of liquid oxygen and carbon-based fuel and would feature high mass and performance characteristics, high reliability and low development and production cost. KBKhA documents showed that during 2007, the RD-0146 engine was test-fired eight times, burning hydrogen and six times burning methane fuel. An original assignment to develop RD-0146 came from Khrunichev enterprise. Ultimately, the hydrogen-propelled version of the engine was chosen for the Rus-M project. RD-0146 engine was reported to produce a thrust of 10 tons and deliver the specific impulse of 463 seconds. Following its debut onboard Angara A5 rocket, RD-0146 was expected to go through a new series of ground firings during 2014-2015 at NITs RKP center as part of the full-scale testing of Rus-M's second stage. Borrowing a concept first developed for the Energia rocket, TsSKB Progress decided to use a special platform which would serve as the interface between the launch vehicle and its launch pad. Known as Block Ya, the structure would feature five receptacles and would be compatible with the three- and five-booster configurations of the rocket. 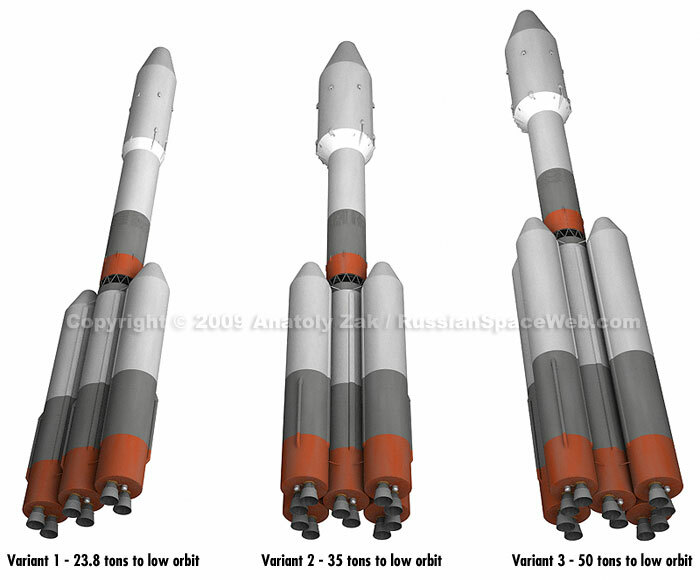 As a result, the future launch facility could host all but one rocket from the Rus family with payloads ranging from 3 tons to 40 tons, according to TsSKB documents circa 2008. In April 2009, the head of TsSKB Progress quoted 40-ton and 60-ton versions of the vehicle, which could use the same launch facility. As it transpired in the spring of 2009, the Rus-M project had a "built-in" capability for an upgrade to reach a payload capacity of 60 tons to low-Earth orbit to support lunar expeditions. To achieve this capability, the developers apparently hoped to use a five-booster combination on the first stage. 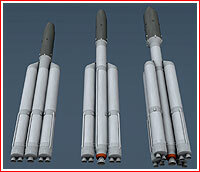 All five boosters of the first stage would also have to be streched to accomodate larger propellant load. (341) With the use of variable thrust, the strap-on boosters of the first stage would separate prior to the core stage burnout. Instead of four RD-0146 engines on the original Rus-M, the second stage would likely sport a much larger single engine burning liquid hydrogen and liquid oxygen. 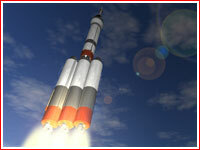 Presumably, it could be based on the RD-0120 engine which powered the core stage of the Energia rocket. However any thought of increasing the diameter of the second stage beyond the accepted 3.8 meters would exclude the possibility of transporting the vehicle by rail. As of 2009, exceeding the parameters of rail transportation was not acceptable for the Russian government. If ever built, two Rus-M-derived rockets with 60-ton payload could support Russia's contemporary plans for its first expeditions to the Moon, involving rendezvous in lunar orbit. Under such a scenario, one launcher would carry a light-weight unmanned lunar lander and another a manned transport ship. Both spacecraft would be equipped with Earth escape stages, which would enable them to reach lunar orbit, where they would dock for crew transfer and subsequent landing. A heavier lunar lander, which would be needed for long-term exploration of the Moon, would require a third 60-ton rocket carrying a separate Earth-escape stage. During an International Astronautical Congress in October 2009, the head of Roskosmos, Anatoly Perminov, said that building "blocks" of the Rus-M vehicle would enable the low-cost development of a heavy vehicle with a payload of 50-60 tons, while the "components" of the same launcher would pave the way to a super-heavy rocket, capable of carrying 130-150 tons to low Earth orbit. Perminov also said that the Rus-M could serve as a testbed for the components and technologies of future reusable launch vehicles. In June 2010, as the preliminary design of the Rus-M was approaching the conclusion, the head of TsSKB Progress, Aleksandr Kirilin, told the semi-official Interfax AVN news agency that a 100-ton class booster was still in the upgrade plans of the Rus-M program. An industry-wide tender for the development of a manned launch vehicle was officially started on Feb. 14, 2009, when all participants were suppose to submit their proposals to Roskosmos. Only two main projects were actually competing -- one from the Khrunichev enterprise, and one from TsSKB Progress. Since government requirements closely matched TsSKB's proposals and left practically no room for an alternative architecture, Khrunichev had no choice but to draft a proposal identical to that of Samara. Still, the company apparently left on the table a proposal for a man-rated Angara-5P rocket, as an alternative. According to unofficial reports, the formal opening of envelopes with industry proposals on the new rocket would take place on March 16, 2009. The commission was then expected to make a decision on March 19, 2009. Chulkov told BBC that Roskosmos would have 10 days to complete the formal review of all proposals and the agency would pick a winner by March 25, 2009. The key consideration would be the cost-effectiveness of the proposal, Chulkov said. The decision would be followed by the preliminary design, which was expected to last around one year. In an interview with RIA Samara in April 2009, the head of TsSKB Progress, Aleksandr Kirilin, said that his company had to be ready to defend the preliminary design of the rocket, comprising more than 100 volumes of documentation, by September 2010 at a price tag of 145 million rubles. (The official documentation placed a price tag for the preliminary design at 375 thousand rubles.) The successful completion of the preliminary design would pave the way to the full-scale experimental development of the rocket, culminating with "cold" and "hot" testing of the vehicle at NIIKhimmash facilities in Sergiev Posad. Although Kirilin's interview ran only days after TsSKB had "won" the tender, the head of the company revealed that one of the former Energia-Buran facilities had already been cleaned up for the upcoming project. The building would now be used for the manufacturing of propellant tanks for the new rocket. (329) In June 2009, during the Paris Air and Space Show in Le Bourget, Kirilin told the editor of this web site that the building had previously been used for the application of thermal protection layers on Energia. 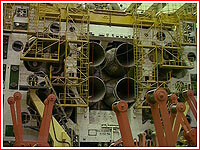 In the meantime, the special chambers used for the thermal protection work had been preserved and could eventually accommodate Rus-M, which, like Energia, employs cryogenic propellants. 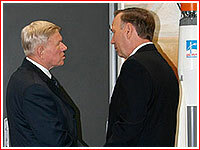 At Le Bourget 2009, Kirilin also said that the immediate goal of the Rus-M program, would be the formation of a chief designer council. A long-time tradition for the Russian space industry, the group would include leaders of key organizations involved in the project. "In the nearest future, we have to form our industrial development team, or at least the core of it, assemble the council of chief designers and conduct the first meeting of this council," Kirilin said. At the time, the event was expected in the third quarter of 2009. According to Kirilin, the council would include representatives of the Makeev center, RKK Energia, TsENKI and NPO Avtomatiki. To accelerate the work on the project, TsSKB planned to conduct preliminary design in parallel with the preparation of the production documentation, Kirilin said, "The project will be developed entirely by means of electronic media." In the meantime, during the same show, representatives of the Khrunichev enterprise said that they planned to re-submit their proposals for the PPTS launch vehicle before the end of 2009. The company would argue that the development of a man-rated launcher derived from the Angara family would be cheaper than that of the currently approved design. The Angara-5P vehicle was apparently considered as a stop-gap measure to launch the 12-13-ton version of the PTK spacecraft on missions to the ISS or a future Russian station. The rocket would reportedly enable the spacecraft to reach the station after just five or six orbits around the Earth. On July 9-10, 2009, the first Scientific and Technical Council, NTS, was held on the Rus-M project at TsSKB Progress in Samara, and it finalized the preliminary design development schedule. The Chief Designer Council and working groups on various aspects of the project were also formed. By the end of 2009, NITs RKP test center (former NIIKhIMMash) in Peresvet (near Sergiev Posad) announced that it was starting preparations for a test program to support the development of launch vehicles based in Vostochny. It would be similar to activities conducted during the development of the Angara family of rockets. By June 2010, official statements indicated that the preliminary design of the Rus-M rocket had entered final stages as planned. As is traditional for the Russian space industry, this phase of development was concluded with a meeting of the agency's Scientific and Technical Council on Aug. 25, 2010, during which developers "defended" the project and Roskosmos formulated its assessment of the completed work. The meeting was to be followed by the delivery of the design materials for an independent expertise. According to Aleksandr Kirilin, the head of TsSKB Progress, approval of the preliminary design would clear the way for the setup of a construction schedule for the Vostochny launch facilities. A new phase in the development of the Rus-M launch vehicle started on Oct. 22, 2010, with the Russian government's announcement of a federal tender for the work on the so-called "Technical Project." The Technical Project is the Russian equivalent of what is known in the West as Phase B or a detailed design -- which is essentially a second phase in the research and development of the vehicle or system, following the preliminary design. The Russian space agency, Roskosmos, earmarked 1.63 billion rubles ($53.5 million) for the year-long work within on the Technical Project. The formal review of bids by the industry and the awarding of the contract for the Technical Project was originally scheduled for Nov. 22-23, 2010.
training facilities and means of transportation for the rocket and its components. Also, the Technical Project would include calculations and experimental work aimed at validating the chosen version of the rocket. In its requirements for the development of the Technical Project, Roskosmos, specified a number of additional features for the future rocket. For example, beginning with the loading of propellant into the rocket, all manual operations on the pad would have to be excluded from the pre-launch processing. The only exception would be the boarding of the spacecraft crew and its evacuation in case of emergency, or a launch scrub. The Rus-M complex would have to be capable of 20 missions per year with the preparation cycle (launch campaign) not exceeding 30 days. To support this launch rate, the ground processing building would have two assembly facilities for the parallel preparation of two rockets. A special transporter powered by a pneumatic system would be used to carry the rocket from the processing area to the launch pad. Given the use of liquid hydrogen onboard Rus-M, Roskosmos asked developers to evaluate whether the construction of a hydrogen production plant in Vostochny would be more economical than the delivery of this cryogenic propellant from another site. The formal opening of envelopes with proposals for the Technical Project apparently took place on Nov. 29, 2010. As expected, Roskosmos favored the architecture of the Rus-M rocket drafted by TsSKB Progress over the alternative proposals from the Khrunichev enterprise, industry sources said. Roskosmos' requirements for the Technical Project specified a number of details on two variations of the upper (third) stage, (sometimes referred to as a space tug) for the Rus-M rocket. The primary job of these vehicles would be boosting unmanned satellites from initial parking orbits into higher orbits around the Earth or into deep space. The development project code-named Dvina, after a Russian river, envisioned a rocket stage designated 11S861-03 (a version of Block D upper stage) and a KVRB stage employing liquid hydrogen propellant. Separate projects, designated TK-Vostok and Dvina KVSK funded the development of support facilities for the 11S861 and KVRB stages respectively. With the use of these upper stages, Rus-M was expected to deliver no less than 4.5 tons of payload to the sought-after geostationary orbit, in addition to its primary task as a carrier of a new-generation manned spacecraft and other 20-ton payloads to low Earth orbits with inclinations 51.7 degrees and 63 degrees toward the Equator. On October 7, 2011, the new head of the Russian space agency, Vladimir Popovkin, told the Russian Duma (parliament) that the agency had decided to abandon the development of the Rus-M rocket. Popovkin said that the program had been consuming 37 percent of the agency's budget, however these funds would not be enough to have the vehicle ready anywhere near the projected date of the first launch in 2015. Popovkin added that the agency would not need the new launcher and would be able to use already available rockets, apparently referring to the Angara rocket. In development since the beginning of the 1990s, the Angara family of space launchers would have similar capabilities to Rus-M, however the introduction of the new rocket had been years behind schedule. Popovkin went on to say that after Angara starts flying from Plesetsk, the agency might make a decision to build another launch pad for this new rocket in Vostochny as well. The cancellation of the Rus-M program had been rumored for quite some time and the plans to introduce the vehicle in 2015 had never been considered realistic by observers. Recently, the agency looked at the plans to bring the Angara rocket to the prospective launch site in Vostochny, which was originally expected to host Rus-M missions. However, the construction of Vostochny itself was continuously delayed and with more realistic prospects of launching Angara from Plesetsk and Baikonur, the yet-to-be built spaceport could be seen as another costly duplication. *No less than 20 tons according to the technical assignment; 23.8-ton payload will apparently require an additional engine firing at apogee to enter orbit. **A payload would have to gain an additional 1,500 meters per second in velocity (Delta V) with its own propulsion unit in order to reach a geostationary orbit. 2009 Feb. 14-16: The Federal space agency, Roskosmos, accepts bids from the industry for the preliminary development of the PPTS launch vehicle. 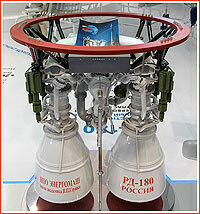 2009 March 16: Roskosmos representatives unseal bids for the development of the PPTS (Rus-M) launch vehicle. 2009 March 19: Roskosmos formally names TsSKB Progress the winner of the tender for the development of the launch vehicle for the next-generation spacecraft. 2009 April 10: Roskosmos signs a contract with TsSKB Progress for the preliminary design phase, EP, of the development of the launch vehicle complex, RKK, for the Vostochny cosmodrome. 2009 July 8-10: The key participants in the Rus-M project hold a Scientific Technical Council, NTS, at TsSKB Progress in Samara, which finalizes the preliminary design development schedule. 2009 Sept. 22: The Council of Chief Designers for the Rus-M project holds its first meeting in Samara. 2010 January: The Council of Chief Designers for the Rus-M project meets in Samara. 2010 May 16: TsAGI research institute and TsSKB Progress bureau sign an agreement on cooperation in the development of Rus-M project. TsAGI engineers join working groups studying the aerodynamics and strength aspects of the project, according to TsAGI press service. 2010 Aug. 25: Roskosmos conducts a formal review of the Rus-M preliminary design. 2010 September: A preliminary design of the launch vehicle for the PPTS system to be completed (as of the 2009 schedule). 2010 Oct. 22: The Russian government announces a tender for the development of Technical Project of the Rus-M vehicle. 2010 Nov. 29: Roskosmos reviews proposals for the Technical Project of the Rus-M launch vehicle. 2011 Feb. 18: The Chief Designers Council on the Rus-M project meets in Samara to discuss basic characteristics of the ground infrastructure of the future launch vehicle. 2011 June 2: The Chief Designers Council on the Rus-M project meets in Samara to discuss the status of the work on the vehicle, its systems and launch facilities, as well as plans for testing of the rocket's components. 2011 Sept. 16: The Scientific and Technical Council on the Medium-class booster for Vostochny launch site holds a meeting at TsSKB Progress in Samara to discuss the state of readiness for the defense of the booster's Technical Project. The event featured presentations from all major industrial participants in the project. 2011 Oct. 7: The new head of the Russian space agency, Vladimir Popovkin, told the Russian Duma (parliament) that the agency had decided to abandon the development of the Rus-M rocket.